It's almost Halloween and I can hardly believe that October is almost over. I feel like it flew by! It's been a fun month, but he most fun comes next week when the kids get to Trick-or-Treat. 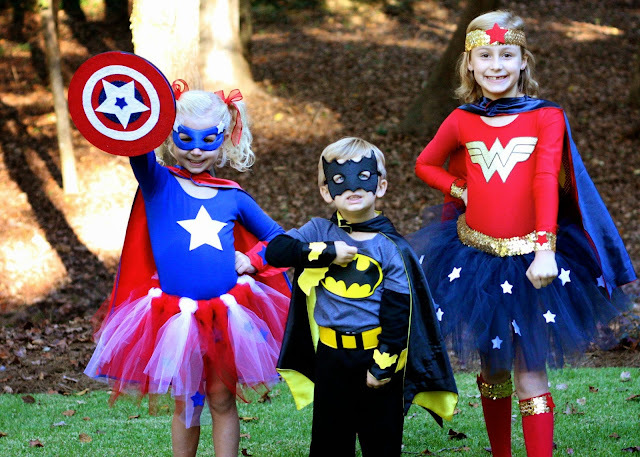 Actually, starting today we have some full costume parties and events planned so the kids are so excited to dress up. Each year when we start getting the costume catalogs they look through and try to come up with ideas. 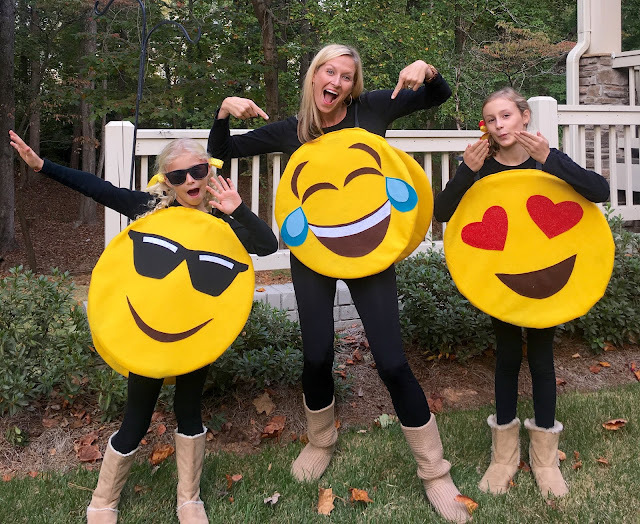 Long gone are the days when I could have full control and dress them in cute coordinating costumes. We made several trips to Halloween shops and looked at tons of ideas online and finally they narrowed it down. Boo-Boo was dead set on a camo ninja and a camo ninja is what he will be! That costume was an easy order and check-it-off the list type of thing thanks to our friends at Oriental Trading. 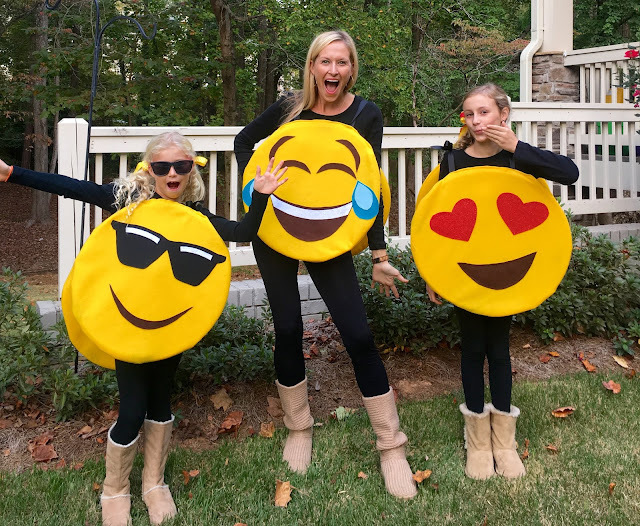 Little Mama spotted an emoji costume at one of the costume shops we checked out, but it wasn't the emoji she wanted so I assured her we could find one to order. Well, little did I know that they would be hard to find and sold out pretty much everywhere. She was set on that idea though so I promised her I would make the costume. Blondie, the indecisive one, got wind of the emoji idea and her indecisiveness went right out the window. She was sure she wanted to be an emoji also, so that meant I needed to get to work. It also meant I would be really happy because at least two of the three would be in coordinating costumes! 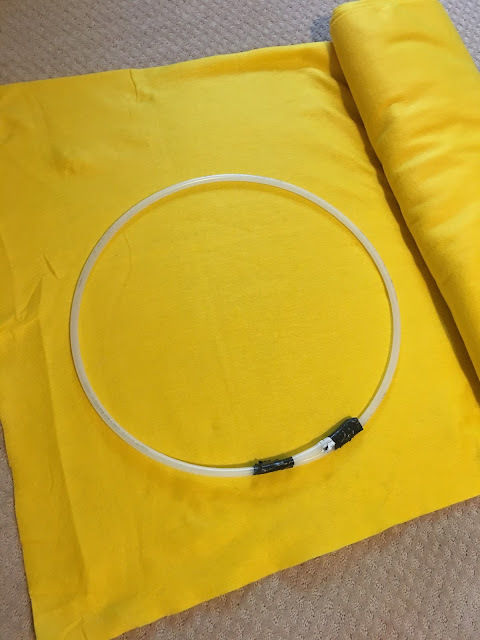 I used felt to make these costumes and while I could have just cut out the circles, I was afraid they wouldn't hold their shape, so I went on a hunt for hula hoops to sew into the felt. Those were hard to find this time of year, so I ended up browsing the aisles at the hardware store to see if I could find something else that might work. 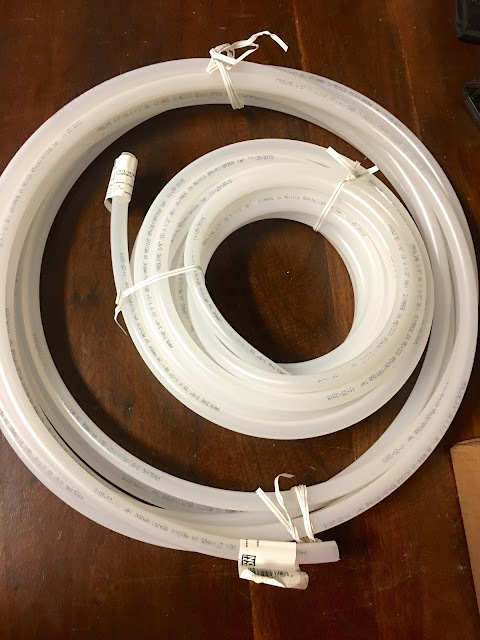 I came across this piping that was in the plumbing section and it worked great. 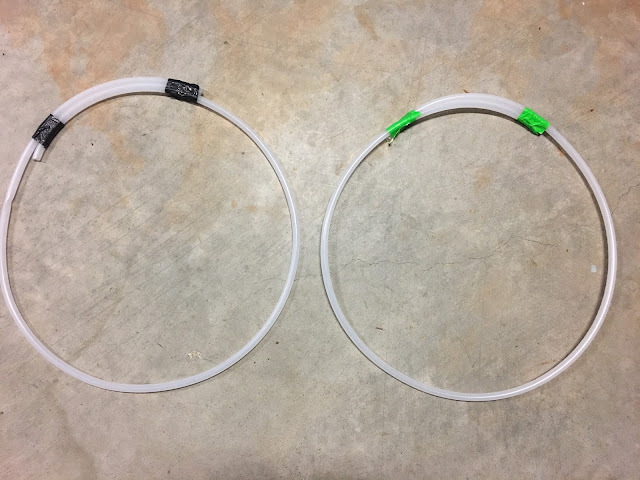 I cut it in pieces, formed circles and duck taped the ends together. Next I used that as my guide to cut two felt circles for each form and sewed the circle forms into the felt. 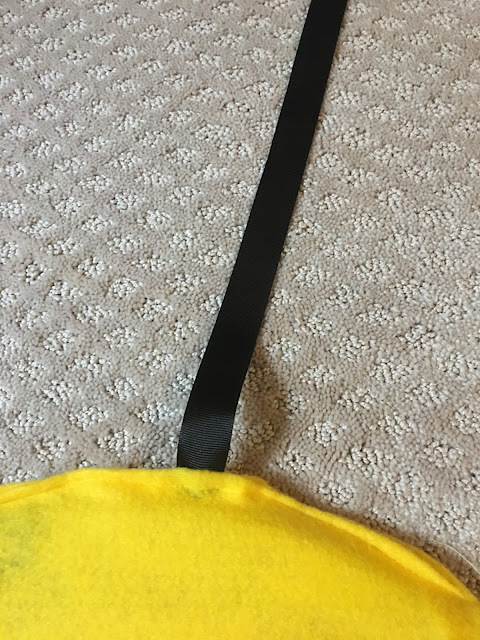 I also sewed in ribbon at the top so the front and back of the costume could be tied together. 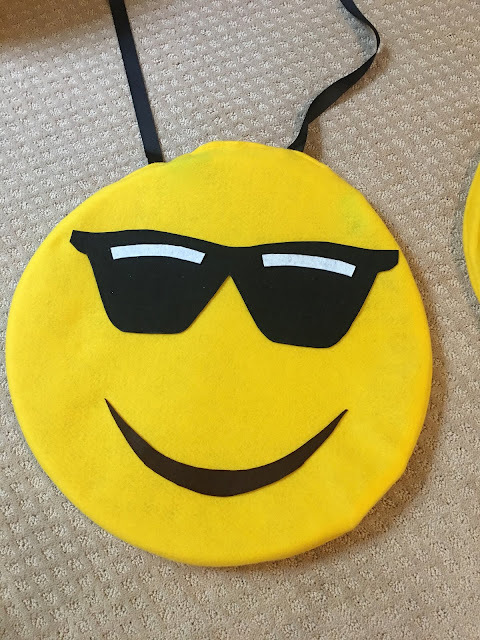 Now the yellow circles were ready to become emojis! 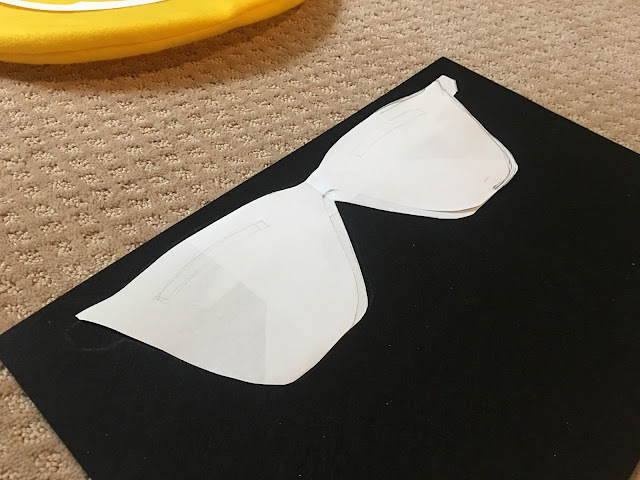 First I used printer paper to sketch out the designs I would need. 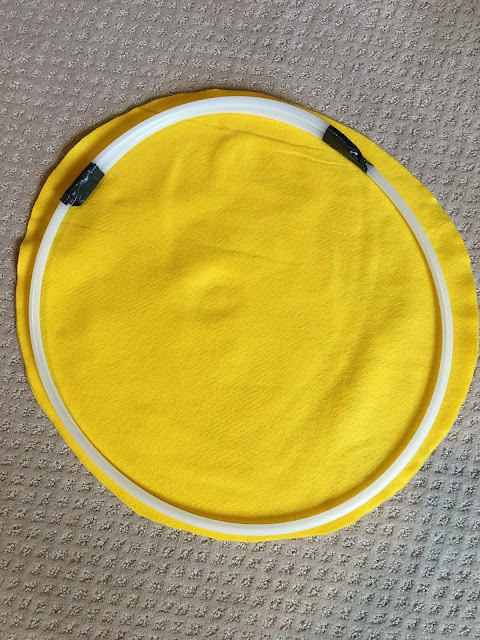 I cut and laid all the pieces on the circles just to be sure it would look right before I cut the felt. I used the squares of felt you can get from the craft stores. It's either $0.33 or $0.77 each depending on the type, but it is so much easier to work with and if you only need a little blue, you only buy a little bit. 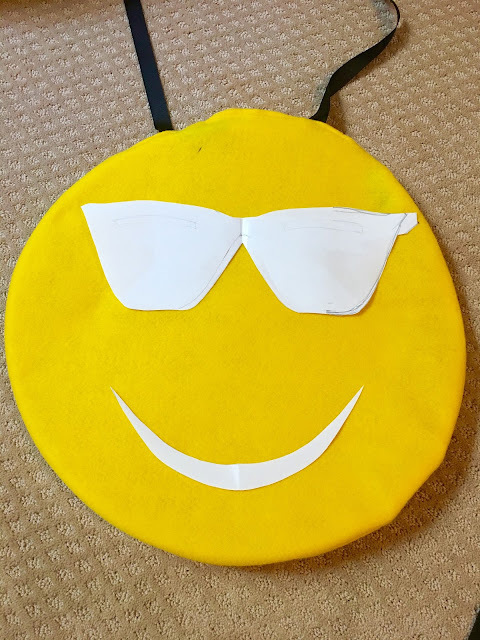 I pinned my patterns to the felt, cut carefully, and laid it all on the circles one last time before gluing it all down. 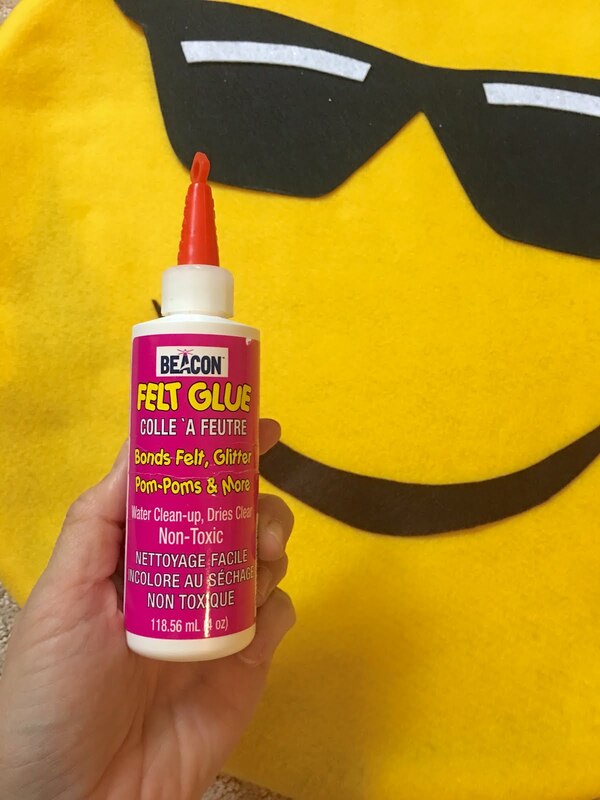 I had this felt glue left over from the DIY Superhero costumes I made a few years ago and it did the trick. I let the glue dry for about 30 minutes and they were ready to try them on. 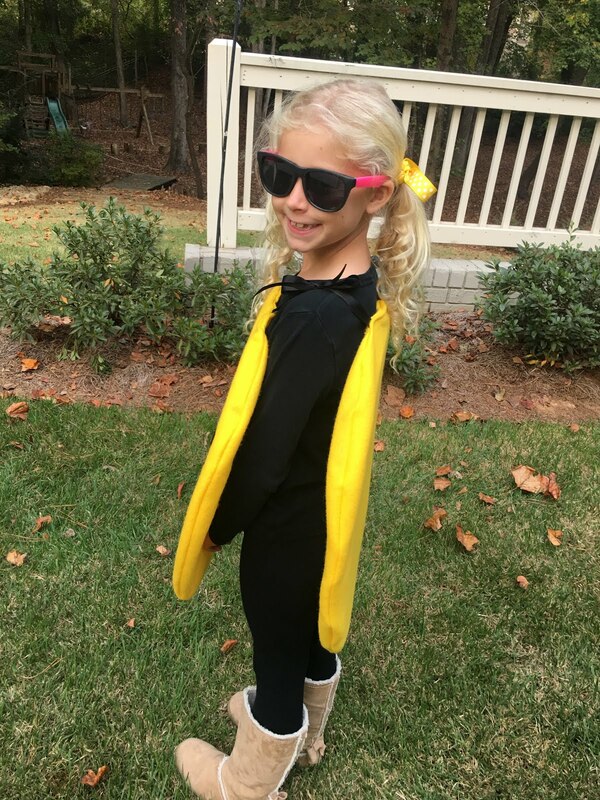 This costume is like a sandwich board style that ties at the top and has a front and back. The girls were so excited and loved the way their costumes turned out! And because I love Halloween and dressing up I agreed to dress up with them. I made myself my favorite emoji...the crying/laughing one (as they call it)! Now we are all set for their sports costume parties and for the real-deal trick-or-treating on Monday! These are adorable!! Do you know about how much yellow felt you used per costume? I really just sort of estimated and bought more than I would need. I can't remember exactly, but I think it was close to 3 yards each. So you did the same emoji for the front and back? I used your costumes as inspiration for my daughter's emoji costume this year. Thank you! We ended up using about 1.5 yds. yellow fleece and 1/4 yd. 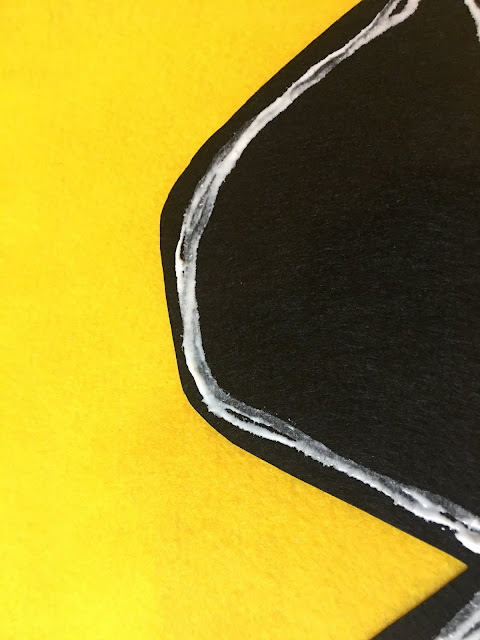 black broadcloth. We sewed the broadcloth pieces on. 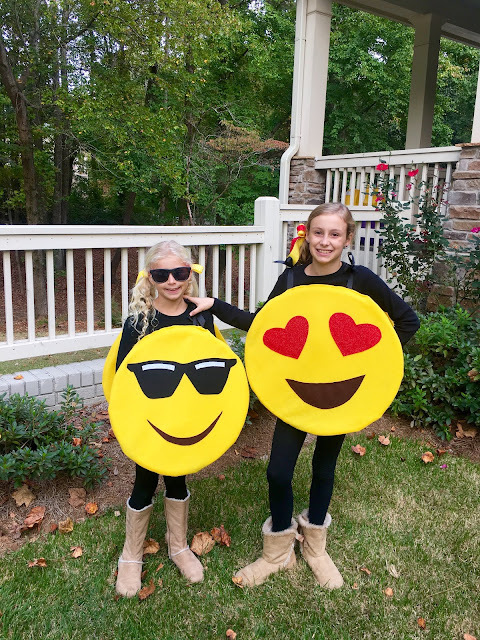 My daughter is super happy with her costume in her favorite emoji! Your costumes are so vibrant which inspired me to make costumes for myself and others at work. 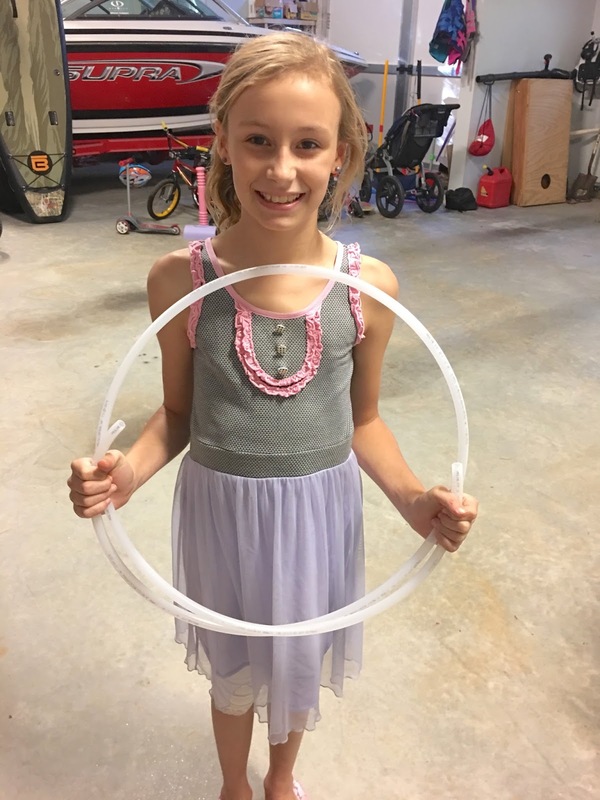 I was able to find hula hoops at the Dollar Store which made life easy. 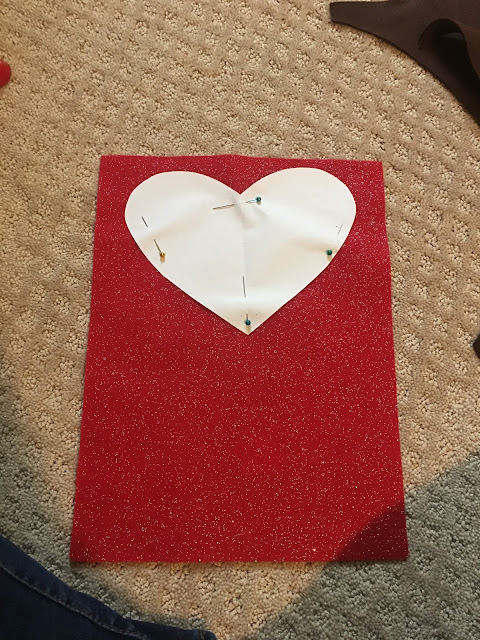 I used a glue gun to do it all, expect when I glued the emotions on. I used a spray adhesive for that. Thank you! This post really helped and I am so glad we did not buy the non-vibrant foam ones from Halloween costume stores.